I am delighted to be bringing you National Nutrition Month from the perspective of a total basketcase. Whatever this is, it goes like this: SICK fine SICK fine SO GUESS WHAT TODAY WAS. But I am back from the doctor with diet instructions and Dexilant for the stomach acid, which has been bad because there's no food in my stomach and also this is stressing me out. And hilariously, the theme for National Nutrition Month is "Eat Right With Color." So we can get right started with white! I already knew about BRAT: bananas, rice, applesauce, and toast. Though admittedly I needed to stick to that for more than, you know, one day in a row, and not throw in a sub sandwich and three slices of pepperoni pizza every other. Which sort of explains the SICK fine pathology. Whaaaaat, I'm so hungry! Is this why they call it brat? I'm supposed to drink Gatorade for electrolytes and also eat yogurt for cultures. Maybe I can get wild and add tofu after a few days. Oh, I should explain the bananas? I'm trying to get back to refueling, even though I'm still not very hungry after practices. Which is possibly where all this trouble started, not that Sultan's doesn't have the best falafel sandwiches. Probably just too much to digest after practice, I've been defaulting to smoothies and pretty light smoothies at that. I use bananas as a base for most of my smoothies. 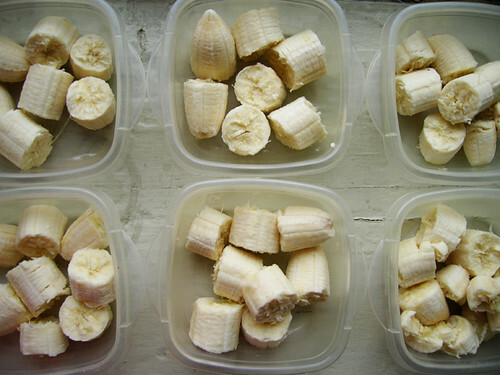 Bananas are good for smoothies and smoothies are good for bananas, too. You can just break them up and stick them in the freezer. As in a time machine, and not a Yoko Ono art project on the kitchen counter.